Spector & Co. began in 1964 selling custom branded writing instruments. Today, the company is a leading supplier of promotional products in North America with a focus on travel accessories and writing materials. Their 65,000 square foot facility in St. Laurent, Quebec offers thousands of different products with 30 decorating options from digital printing to laser engraving. PACLINE was contacted by Spector & Co. to help manage and improve their storage and retrieval process of bulky items such as backpacks and duffel bags. Their current system utilized manual push carts on the floor to store and transport products through the labeling and shipping process. This cart system was causing the product flow and inventory management to be disorganized and inefficient. After reviewing some of the Retail Conveyor Applications on the PACLINE website, Spector & Co. recognized the opportunity they had if they could utilize the empty overhead space in their plant. To get a better understanding of how the custom conveyor would work for their products, Spector staff visited the PACLINE office for a live demonstration of the system. Spector & Co. needed to improve their storage and retrieval system for handling bulky items such as backpacks and duffel bags. Hundreds of backpacks and duffel bags needed to be quickly accessible for custom orders, where the items would be decorated and packaged for shipping. The use of manual push carts was taking up a great amount of valuable floor space in the facility and caused the process to be very disorganized. When Spector & Co. came to PACLINE they had envisioned a three-loop conveyor system to manage their storage and retrieval process. 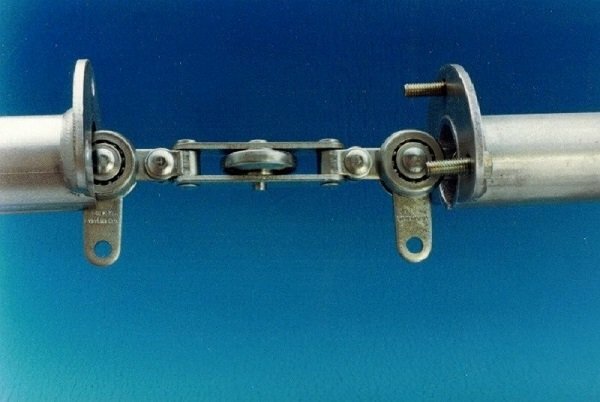 However, PACLINE determined that a system incorporating five custom conveyor loops would be the best solution. 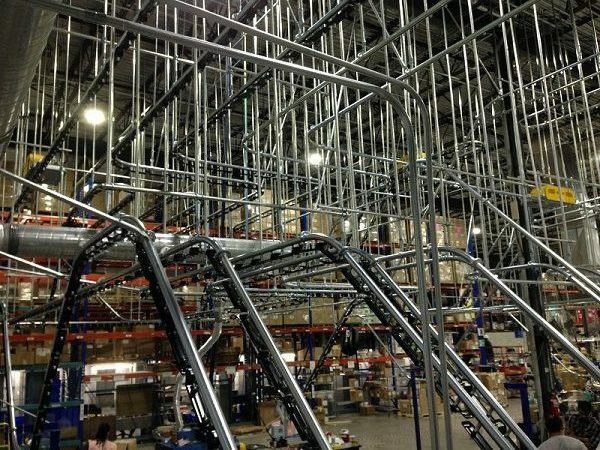 This would allow Spector & Co. to maximize overhead storage, improve organization, and increase product flow efficiency. Having a storage and retrieval system with five custom conveyors totaling 1400’ would allow Spector & Co. to store an inventory of 1400 bags at once! The main challenge in designing the overall system was how to install five conveyor loops within the 40’ x 60’ floor space provided. Installing the five loops in the designated space, required that the conveyors overlap vertically. This posed another challenge in engineering the conveyor support system. 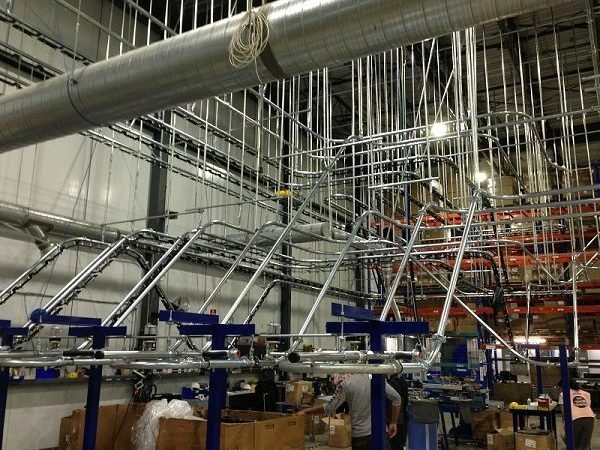 The steel hanger-rods, attaching the custom conveyor to the ceiling had to be placed so that they did not interfere with any conveyor track or any of the 1400 products, of various sizes as they moved along the system. The final system layout looked disorganized and jumbled, however, every single track and hanger was strategically placed so that the 5 systems would run smoothly inside the 40’ x 60’ area. 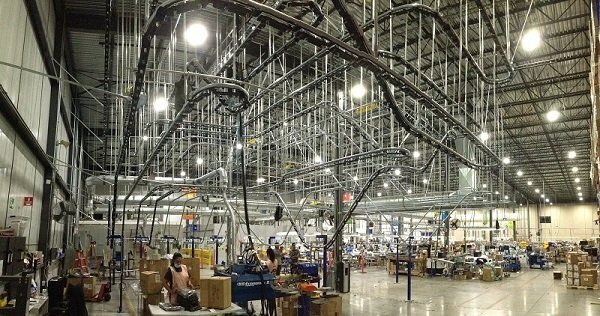 Installation of this PACLINE system was tedious with 5 conveyor loops going from floor to ceiling, 1400 feet of track and over 1400 product hangers – all contained in a 40’ x 60’ space. However, the PAC-LINE™ enclosed track conveyor that was used for this project, is well known for being easy to install. 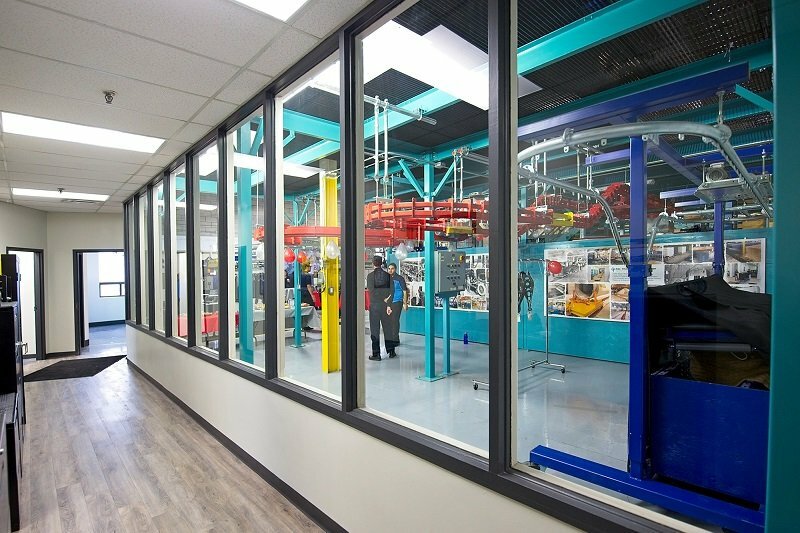 In fact, it is so simple that Spector was able to use their own factory staff, under the supervision of one PACLINE installer, to complete the entire installation. This kept the Spector staff busy while the plant was undergoing renovation and saved costs with only one hired installer! The PACLINE custom conveyor system provided Spector & Co. with a unique and highly efficient system for managing inventory and processing numerous custom orders for promotional backpacks and other travel/carry bags. With 5 separate custom conveyor loops, items from various orders could be sorted, transported and tracked at all times through 5 different decorating processes at the same time. Orders were now processed faster and more accurately. With the overhead conveyors replacing the cumbersome carts on the floor, less staff were required to manage the operation and valuable floor space was now freed up for other equipment.